Sunglass-sized virtual reality goggles may be closer than we think. The digital worlds we see through today's virtual reality headsets are amazing, but the goggles themselves leave something to be desired. Despite offering high resolutions and room-scale VR, the Oculus Rift and HTC Vive are bulky, front-heavy devices. Wouldn't it be better if they were smaller? Soon, they could be. Today at Augmented World Expo, Kopin revealed a new, 4K reference design VR headset that's half the size of today's consumer goggles. It's a startling difference, too. Most headsets are at least as large as Google's Cardboard viewer. Kopin's prototype, on the other hand, is at least a third smaller. That's because it's built around two tiny, low-power high resolution displays that measure just 1-inch diagonally -- the same tiny 2K VR panels the company showed off at CES earlier this year. 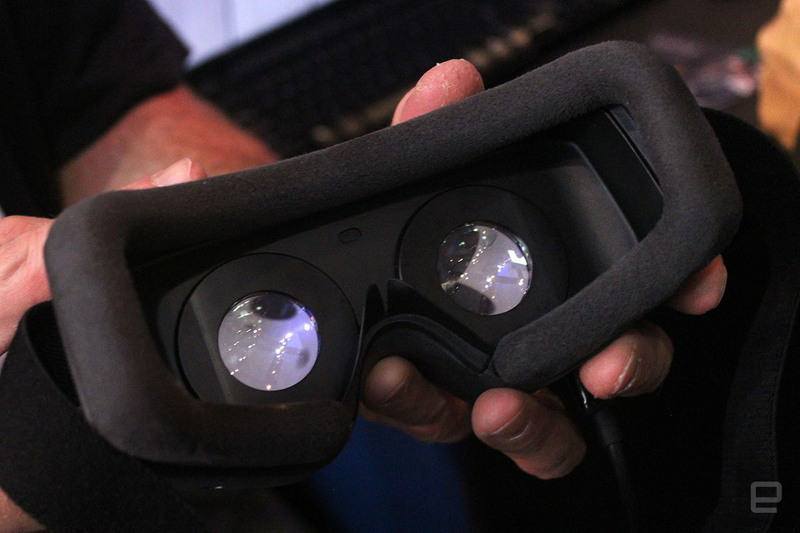 The end result is a diminutive headset that looks like a squashed version of the Oculus Rift. I only wore the rig for a few minutes, but during that time the compact, lightweight headset felt comfortable. Unfortunately, it's not perfect. 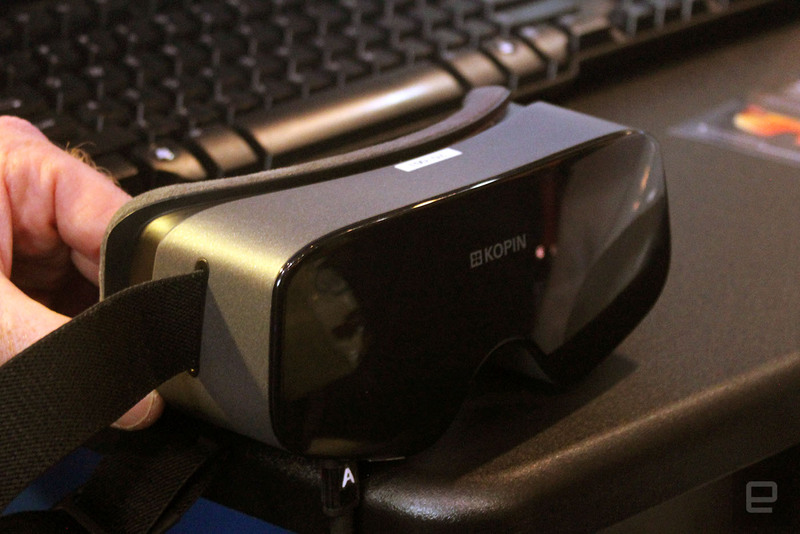 Kopin's pint-sized VR headset showed me sharp, high-res visuals, but it confined them to a small field of view. 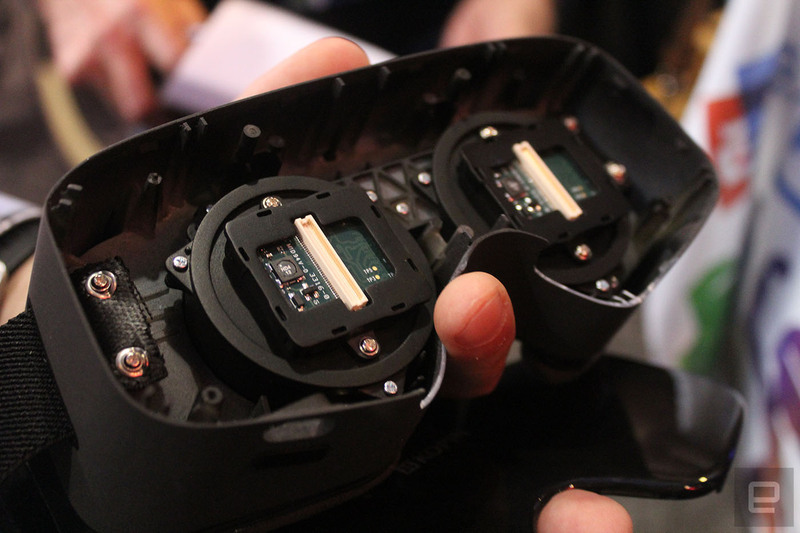 The shrunken optics offer a sphere of vision that's about half the size of a typical VR headset. The optics can't currently be adjusted either. Kopin told Engadget the company is experimenting with different lens configurations to try and expand the FOV, but it's ultimately a limitation of the display technology. A one-inch 2K screen is amazing, but it's just too small to make a completely immersive VR headset. Still, we're talking about an early prototype here, and Kopin says the above issue can be fixed. The miniaturized screen technology can be used to make larger displays, and improved optics could also increase the FOV -- but it might not need to. Kopin announced the prototype with the eventual goal of fitting a VR display into a device about the size of a pair of sunglasses. If they created a headset that really was that small and portable, a loss of peripheral vision might be an acceptable compromise. Either way, it's still a bit early to judge. The company says it only started designing the prototype two months ago, and there's still a lot of work to be done. Today, the company's tiny reference headset is just a curiosity -- but it's an encouraging one. One that may lead to smaller, lighter and more consumer accessible virtual reality in the future. And that future may come sooner than we expected.